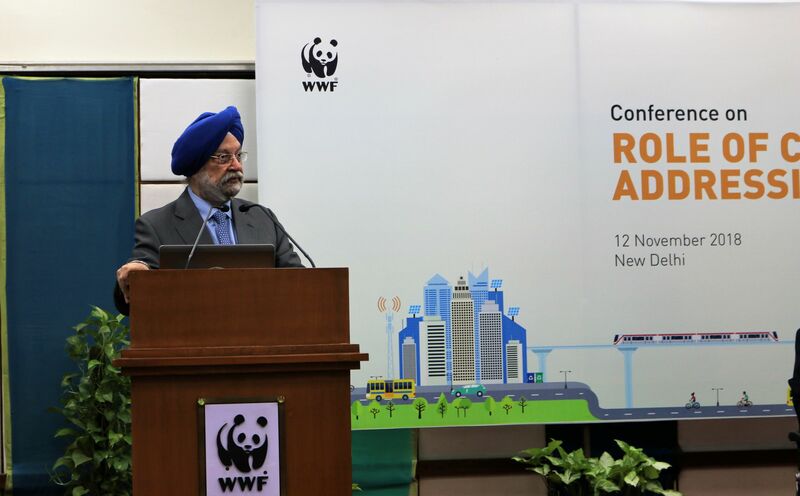 New Delhi: A conference on ‘Role of Cities in Addressing Climate Change’, organized by WWF-India in partnership with ICLEI-SA on 12th November 2018 in New Delhi, deliberated on the role that the cities play in addressing climate change, from a mitigation and resilience perspective. The conference was inaugurated by, Sh. Hardeep Singh Puri, Hon’ble Minister of State (I/C), Ministry of Housing and Urban Affairs, Government of India, and saw participation from key stakeholders including representatives of central and state governments, city municipal corporations, financial institutions, multilateral organisations, research institutes, think tanks, and NGOs. The conference was part of WWF-India’s work on cities and climate change, and the One Planet City Challenge (OPCC) platform. The city of Rajkot was felicitated during the conference as the OPCC National Winner 2018, and Pune got a Special Mention by the international expert jury. Cities, which are home to over half of the global population and responsible for more than 70 percent of global greenhouse gas emissions, are particularly vulnerable to the impacts of climate change, manifested through frequent and extreme weather events. Considering the social and economic development hindrances caused due to climate induced impacts, adopting mitigation strategies and building resilience to climate change is increasingly becoming a high priority for cities, whilst learning from each other in the process. Globally, major agendas such as SDGs, the Action Agenda, and Paris Agreement are recognizing cities as solution hotspots that contribute to each country’s Nationally Determined Contributions (NDCs). The global momentum for climate action in cities and the undeniable imperative to include climate change in urban planning and policy has inspired a groundswell of support for local action around the world. Indian cities are also part of the global momentum for transformational change whereby several cities have exemplified their role in addressing climate change. Key examples include a Heat Action Plan for Ahmedabad, a Climate Resilience Strategy for Surat, BRTS and the Metro – most notably in Ahmedabad and Delhi respectively, implementation of a bicycle sharing scheme and street redesign project in Pune and waste management in Indore. With Indian cities making considerable efforts in undertaking progressive actions towards integrating sustainability in their initiatives to combat climate change, this conference served as a platform for the cities of Rajkot, Pune, Nagpur, Chandigarh and Thane to share their work on climate smart planning and tangible low carbon actions. The conference also highlighted the need for integrating climate action into development planning in cities and to build capacities in cities to achieve this. It also outlined the importance of taking a collaborative approach by departments and organisations towards mainstreaming climate issues across different initiatives with an intrinsic role being played by the citizens to drive this change. The deliberations also revolved around the need for developing integrated strategies and policies to address climate change and air pollution not just from the environment and health angle but also from social and economic perspectives. The conference went on to delve upon the challenges and the economic case for climate resilient planning which stated the need for development of infrastructure in cities, taking into consideration pre-disaster planning and integrating forecasting mechanisms to build climate resilience. About OPCC: WWF’s global initiative for cities – One Planet City Challenge (OPCC) aims to mobilise action and support from cities in the global transition towards a climate friendly future, and to stimulate ambitious plans for low carbon development, as well as enhancing the use of sustainable, renewable and energy efficient solutions. 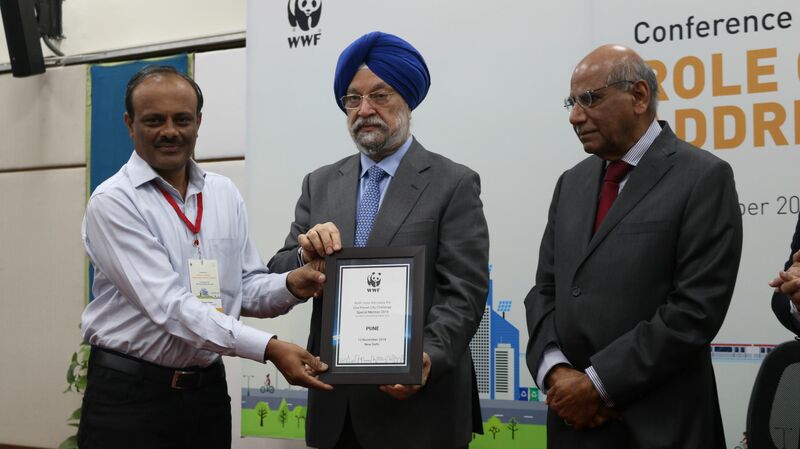 Since 2012, WWF-India has engaged with 25 cities, with ICLEI-SA as a technical partner. Many of these have been selected as Smart Cities. Delhi, Coimbatore, Thane, and Rajkot have been national winners of the challenge in previous years. 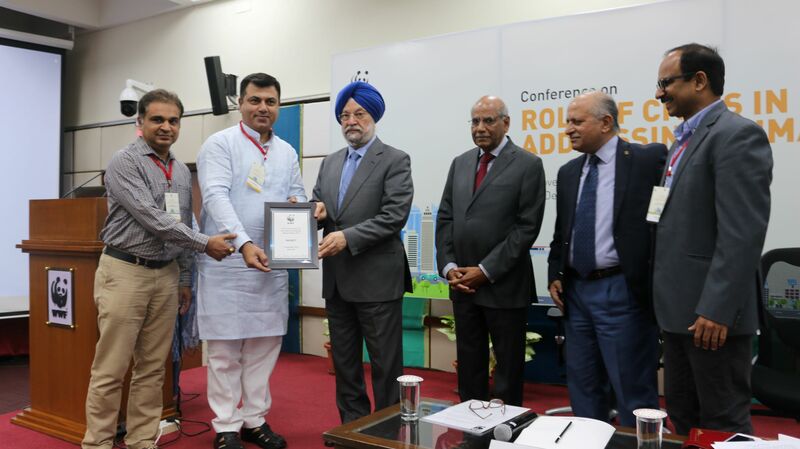 Rajkot was selected as the national winning city from India for the second time in 2018 and recognized for its sustainability actions at the OPCC Award Ceremony held during the Global Climate Action Summit in San Francisco in September 2018.